Silver Arrow Knits! : Cohort Presents -- Check! So here is the cohort cuteness factor! 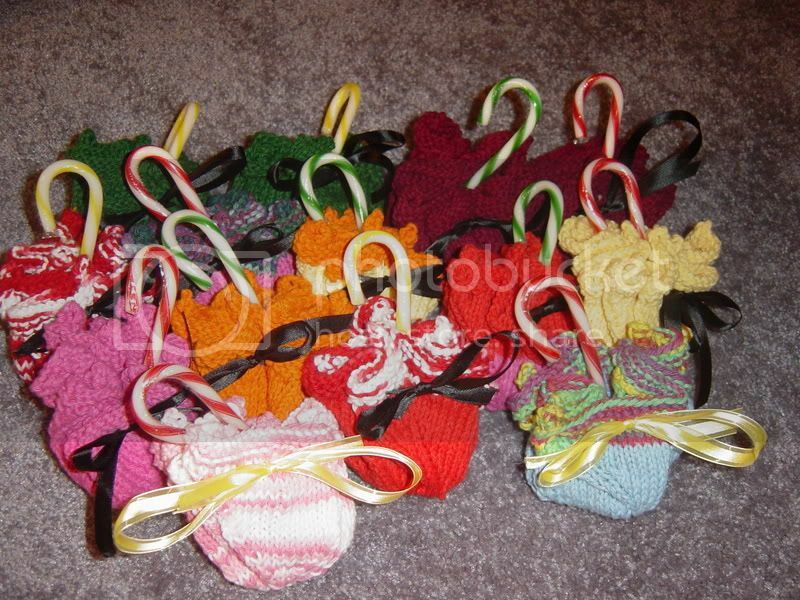 I finished all fourteen washcloths with required chocolate and candy canes and studied for my adulthood exam by last Monday. Phew! I told everyone if I failed out of grad school, because I spent too much time finishing the gifts, to keep the washcloths in a sacred space for all of time. :) For things that took a good amount of time to knit, they certainly took up a tiny amount of space once they were ready to be gifted! On the brightside, I am definitely beginning to knit faster. I think it takes me about two and a half hours per washcloth now. Now I just need to block a scarf and knit three more washcloths for Thursday and I am golden. ::sigh:: Must...knit...through...the...pain. Wow - that is amazing! You must really like your cohort!